Romancing with Words: Romantic Words to the Rescue! 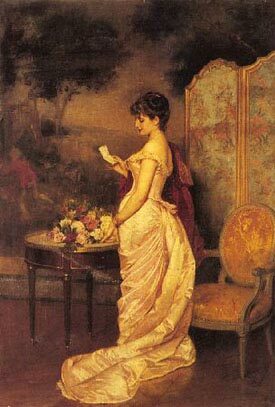 Discover the joy of writing romantic words of love! Browse our romantic love letters to copy, engagement letter samples and famous love letters along with romantic love quotes collection, romantic love notes, and all sorts of other romantic words of love and romantic sayings. Using romantic words and phrases is one of the most, well romantic ways to tell your sweetheart how much they mean to you. Few things will warm their hearts more than receiving a thoughtfully crafted romantic love letter or chancing upon a sweet little love note tucked away for them to find. Your time and effort alone speak volumes to your beloved recipient. There are many ways to incorporate loving words into your love relationship. One of my personal favorites is the use of romantic love quotes in my emails to D. Sometimes they will spark a volley of romantic (and often suggestive) emails back and forth. It's funny that we email each other, working together as we do! This loving banter helps keep a connection and a spark flowing between us. Love and romantic sayings can take the form of romantic love poems written by you or "borrowed" from a poet that you admire. As long as you are not trying to publish your plagiarism, it should be perfectly fine to use romantic poems in this way.. Romantic words of love can be found, copied and saved for later use. I've been known to stand in the greeting card aisle jotting down some new romantic lines and the perfect "turn of phrase" so I can use it later to create my own romantic card or to add to my romantic emails. Always be on the "lookout" for romantic inspiration. It's everywhere! You can also turn to the romantic experts, especially when it comes to crafting the perfect love letter. Try gaining your inspiration from famous love letters written by the likes of Beethoven to his "Immortal Beloved" or Napoleon Bonaparte to Josephine. For those of you who are handy, (or "thumby") romantic text messages are sure to make your sweetheart smile! Romance stories and romance novels can be full of useful romance filled words and passages. Sometimes just reading a certain scenario or section out loud to your lover (or even to yourself!) can elicit a delightful, if not sensuous response! I know I have my favorites! We all have favorite romantic love songs whose music and lyrics make our little hearts beat faster and put that dance in our steps. The poetry of romantic love song lyrics is an abundant source of romantic phrases. Surround yourself with romantic music. Another useful source for romantic words is romantic movie quotes. There is something about the remembered visual effect along with the romantic words that packs a powerful romantic punch. Make a habit of watching romantic movies with your mate on a regular basis. There's gold in them thar hills! So many romantic things to say, so little time! Looking for a heart-felt homemade gift idea? Write 365 love notes to your sweetie.